The scaling question is the most popular question which emerged out of the solution-focused approach. This article describes step by step how you can use the scalling question. Here is a video example. Some time ago, when I was talking with a client an interesting varation of the scaling question emerged between the two of us, which I call the Optimal Zone Scale. The woman I was coaching wanted to learn to be more assertive so that she could defend her personal boundaries and speak her mind on issues that mattered to her. This would help her to feel better at work and to keep her work load within acceptable limits. It would also help her colleagues. By being more assertive she would be clearer to her colleagues who would know then exactly what they could and could not expect from her. Also, she had noticed that colleagues tended to respect and value her more when she acted more assertively. However, my client was also aware that she shouldn't go too far in speaking her mind. She realized that if she would take this too far she could become a shrew. She absloutely did not want that. She did not want her colleagues to become afraid of her or feel intimidated. Being friendly and helpful was one of the most important aspects of her workrole. So she could not afford to lose those aspects of her behavior. When she was explaining this to me I drew the picture of the scale (see right). 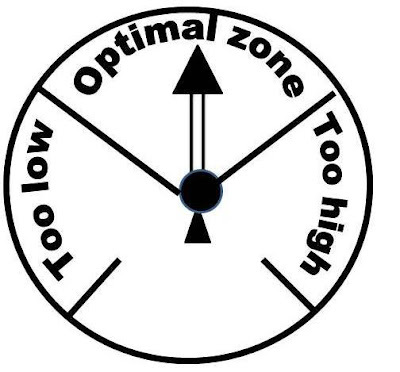 The picture visualizes that there is a zone in which her behavior is effective: the optimal zone, and two zones in which it isn't. On the left she would be too little assertive, on the right she would be over-assertive. This said this visualization was very useful to her. She realized she was now slowly moving to the middle of the optimale zone.